I've always had an appreciation for both a well-written song and a lovely singing voice, which is why I've focused more thorughout the years on vocal tracks rather than instrumental tracks. That comes through even more than usual this week, as I came across a lot of really good songs. Nine of the 12 tracks in this week's playlist are vocal tracks, although even the instrumentals have a melodic feel to them that fit with the rest of the episode. If you appreciate good songs and good singers like I do, this is the episode for you. Take your place to chill on the go with the Dave's Lounge App, which gives you to streaming access all the latest episodes of Dave's Lounge, plus bonus mixes not available in the podcast, for only $1.99. 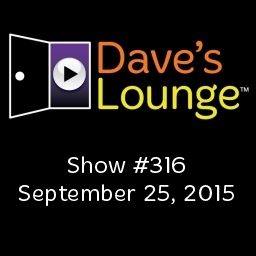 The Dave's Lounge App is now available for iOS, Android, and Windows Phone. Dave’s Lounge #317: More Free Music! Loved Seven24’s Performance and of course me some Submotion Orchestra. They can do no wrong in my book. Excellent episode! I love the new song from Submotion! I am one of the few that enjoys buying the physical release every now and then if it is available (on Vinyl). If it is available from any of the artists in your episodes, it would be great if you could post a link and I would be more than happy to support the podcast by buying through that link! Oh, I forgot to mention that Manu Delago “Why don’t you” and “Doppelganger” from Submotion Orchestra were my favorites from this episode. Seven24’s Performance knocks it out of the park. This episode I don’t seem in agreement with anyone else that has posted so far. My favorite was PKWY’s Comfort (remix), followed by Bob Moses’s Too Much is Never Enough.